As people living with fibromyalgia, we have many concerns, but often overlooked is the health of our mouth. Those of us who have lost teeth and spent a great deal of time in the dentist's chair understand the importance of awareness, prevention, and treatment only too well. The three things we should pay close attention to because of fibromyalgia are TMD/TMJ, bruxism, and dry mouth. According to the American College of Rheumatology, temporomandibular dysfunction (TMD/TMJ) frequently occurs with fibromyalgia. Bruxism (teeth grinding) is associated with TMD and can interfere with restorative sleep, a primary symptom of fibromyalgia, and many fibromyalgia patients also complain of having a dry mouth. Following is information on the three top mouth problems seen in fibromyalgia and things we can do to help. Opposing teeth do not fit together well. Tight muscles due to myofascial trigger points are pulling them out of alignment. Apposing muscles are under stress. There is a physical derangement of the joint due to trauma or degenerative disease, such as osteoarthritis. Temporomandibular dysfunction is often associated with clicking and grinding noises, ringing in the ears, chronic muscular headaches, and head, face, and jaw pain. The pain can extend to the ears, neck, and shoulders, particularly if it is myofascial. Bruxism is a fancy term for grinding teeth. This condition can aggravate the pain associated with TMJ dysfunction and can cause physical trauma to the joint due to repetitive clenching and excessive force. Don’t believe it? Try this, clamp down on your teeth. Now, feel the muscles in your jaw, face, ears, neck, and shoulders. When we do this, we get an appreciation for the stress we put on the TMJ through repetitive and forceful movement. The muscles involved are responsible for expression and the many other jobs the TMJ performs in any given day, and nights too for the many of us who do this in our sleep. It’s no wonder that these tiny, mighty muscles develop myofascial trigger points that can initiate pain and contribute to joint dysfunction. Being a sleep grinder can also interfere with the restorative sleep lacking in fibromyalgia. *If you have hypersensitive teeth, aching jaw muscles, headaches, face, neck and shoulder pain, and tooth wear and damage, you may be grinding your teeth. Many fibromyalgia patients complain of having a dry mouth, which can be due to several factors. Maybe you sleep with your mouth open or wear a dental appliance for bruxism that keeps the TMJ slightly ajar. Maybe you also have hypothyroidism or you are on a medication that causes dry mouth. According to Price and Venables, SICCA can occur in the absence of Sjögren’s antibodies and anecdotal reports support fibromyalgia patient complaints of dry mouth (and other associated symptoms of dry eye, and dry mucous membranes). The cause of dry mouth in this instance is due to salivary glands not producing enough saliva. So, why is this important to mouth health? Saliva is important to aid in digestion, so when there is not enough, it can affect our overall health. Avoid stress (biofeedback may be helpful). Pay attention to posture (decrease stress on the head and neck). See the dentist on a regular basis. Wear a night guard if you are a teeth grinder or have TMJ. Massage your mouth several times a day to help it relax. 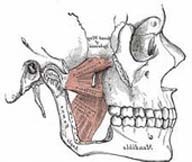 (The masseter muscle is responsible for many actions, including the force applied when we chew, called mastication.) Massage it by putting your thumb in your mouth and your fingers on your cheek trapping the muscle between your fingers and your thumb. Talk with your doctor about your medication side effects. Treatment options are important for treating pain and preserving mouth health, which is important to our overall health. If you have fibromyalgia and have any one or all three of these disorders, having tips and strategies is important. May the force be within normal limits and may your mouth serve you well.